Located literally right next door to Bissell Brothers in Portland, ME is the up-and-coming Foundation Brewing. It's a small operation with a lot of buzz, especially now that they are packaging some of their beers. Epiphany was just canned for the first time in February and I believe a 2nd run is happening at the end of March. So, Epiphany is a self-described "Maine IPA", which would be the first of its style that I've ever heard of. It's a double IPA brewed with Cascade, Citra, Columbus, Ella, and Mosaic hops. If that isn't an All-Star lineup of juicy hops, then I don't know what is. Pours the classic hazy, golden orange with a finger of bright, white head. There seems to be a good amount of sediment and oils floating around and that's great because I love it when Imperial IPA's are unfiltered and everything that makes them great is left inside. Now this is a juice-forward DIPA. The biggest aromas I get are orange juice, clementine, and pineapple. Maybe even an orange sherbert too and piney hops. It's quite mouth-watering. This is what I like in a Double IPA. It's not very bitter up front like a lot of DIPA's, but instead it retains the juiciness from the aroma. It starts with a pineapple juice/grapefruit juice sensation that splashes over the middle of the tongue. It's extremely refreshing until the back, where the earthy and piney hops take a bite out of your palate in a good way, of course. Some spice on the finish with dank, bitter hops. Double IPA's tend to be deserts in your mouth, but this is just refreshing juice almost all the way through. There is no detection of alcohol and it is very easy to drink. You might annihilate your 4-pack without even realizing it (but that's not recommended). 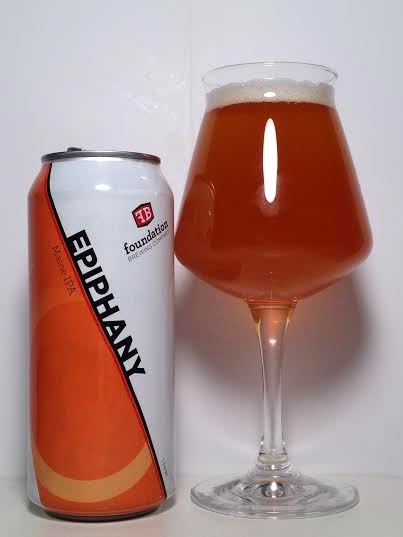 Epiphany separates itself from other DIPA's by being a very juice-forward example of the style, but still leaving room for the bitterness to shine. Reading the hops utilized in the recipe on the can, I was expecting a tropical, citrus explosion and this did not disappoint. Adding in the earthy, piny hops with some garlic/onion actually brings some West Coast IPA into this stellar East Coast IPA. For such a complex DIPA, it is one of the easiest to drink that I've encountered and that's more than enough to make you want to try this again and again.